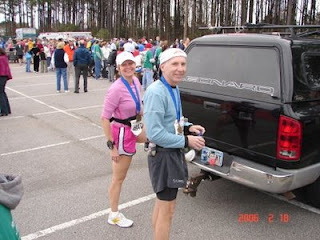 Once again it is time to make the drive down to South Carolina for another Myrtle Beach Marathon. This will be my fifth year in a row running a race that I wasn't sure I would have ever planned to run. It was my friend Jerry that was probably most responsible for getting me to go the first time. Jerry was the one that introduced me to Karla about a year earlier and he told me that she was going to run the 2005 race as her first marathon and attempt to qualify for Boston. Up until that time she and I were only casual acquaintances and had been on one training run with Jerry and Margo and I on New Years. I decided that I would go and run the race with the two of them and handle the pacing duties. I never knew that would be the beginning of this great friendship and training partnership we have shared these past few years. I am not in very good running shape now due to last years injuries and Karla hasn't been running too much in that time either. Since I began training again at the beginning of the year we have been able to get in some good long runs the past several Saturdays including a few in Umstead. Training is going well but we aren't in shape to race a marathon just yet, so we plan to just run it together for fun and training. This will be the 4th time running it with Karla with 2006 the only year I ran by myself as I was qualifying for Boston that year. This will be my 27th marathon and 9th running with Karla. If I'm not racing for a fast time I can't think of a better way to enjoy one than running it with Karla or one of my other friends and I look forward to sharing many more thousands of miles. As always there will be a large group of runners from the NCRC and MTC and I look forward to seeing many of them and hopefully some of you my readers. I'll be riding down with Jerry as usual with Frank and Karla following along. Frank will be running the half again. The photo was taken by Frank after the 2006 race where I ran my pr and Boston Qualifier of 3:35. Hey Joey have a great time at MBM. I will miss seeing you at the expo but look forward to reading about your adventure on your 5th year running!